Utility locator markings protect you. 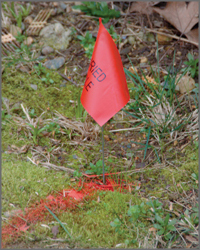 Make sure you and your crew know how to read utility locator markings and know the American Public Works Association (APWA) uniform color code for marking underground utilities. Color code charts are usually available from your local one-call utility locator service. Locator flags are placed within paint marks. If you find flags outside the borders of locator markings, someone may have tampered with them. Contact your local one-call utility locator service.